One of the most innovative products I have ever seen! A combination TV stand with built-in surround sound speakers! Presenting you a powerful, clear studio sound space in the comfort of your own living room! 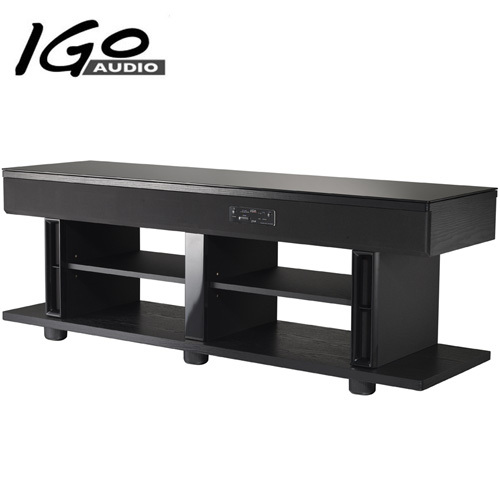 This sleek stand is a sensational home theater system! No more twisted cables running all over the place. All wires are discretely hidden from view. And the speakers blend in as if they are not even there. But when you crank up the volume, you'll definitely feel their presence. Other features include surround on/off, bass boost, and LPCM 2ch. Measures 55.75''W x 15.8125''D x 19.5''H. Fits up to 55'' TVs!